Högbacka focuses on first mothers’ own understandings. Their concerns and deliberations are presented in greater detail and more extensively given the wealth of research on adoptive families and the much lower visibility of families of origin. 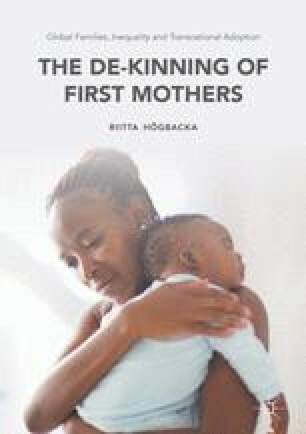 The chapter addresses the concerns of first mothers and their attempts to realise their hopes in difficult circumstances. It examines the complexities of agency in contexts of vital inequality, revealing the challenges faced by the women. The more nuanced analysis reveals a continuum of positions available to first mothers ranging from the most severe to the slightly less severe. Trenka, J. J. (2012). Korean Unwed Moms – Fact Sheet. https://justicespeaking.wordpress.com/2012/11/11/korean-unwed-moms-fact-sheet/. Accessed 12 Oct 2016.